I’m still undecided about setting up the Christmas tree and decorations this year. 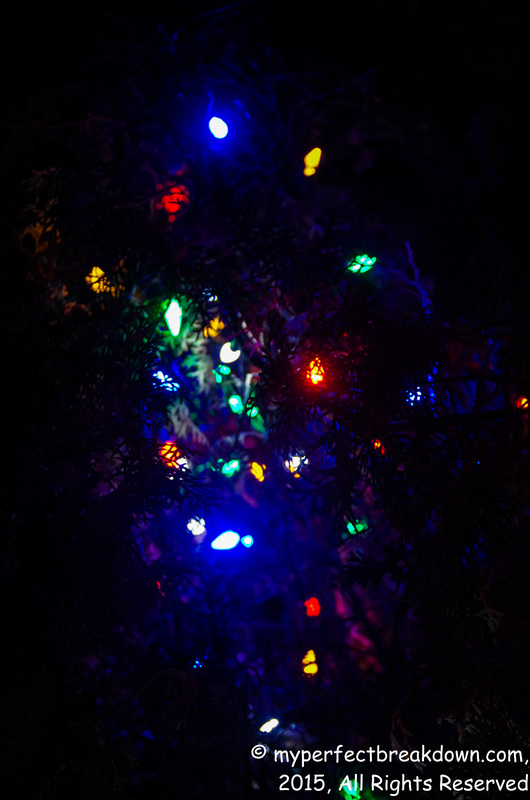 But, I realized that we have one set of Christmas lights outside that is permanently in a shrub because the shrub has grown around them so we just leave them tucked into the shrub all year round. So, I dug out the automatic timer and have set it to go on every evening at dusk for a few hours. Usually we put up a more Christmas lights around the yard, but not this year. This year, turning on this one set of Christmas light was so easy that it didn’t cause any additional stress in our lives. And no additional stress right now makes me happy! So, lights in one outside shrub will be enough. And, at least this way, every time I walk into our house in the evening I will be reminded of Christmas. And I’m willing to bet, the bright and colourful lights it will make me smile. My second happy moment of the week is our bathroom reno. The pictures aren’t beautiful, the moments have not all been wonderful, but the fact that I have a floor and walls makes me deliriously happy!! Soon enough I hope we will be done with the wall repairs so that we have paint, tile and running water! Aww so glad the bathroom is coming along! I think not really decorating for Christmas is a great idea especially since it reduces stress. I really wish I had already decorated and figure now I won’t really get to. But there are way important things in life than decorating. Aww you are sweet! Maybe I can convince my mom to do it for me! Ya we are also doing it ourselves to save money. It’s a ton e of work but I’m optimistic we can have it done by christmas…. Cost us a lot of money and oh my the mess!! I think you both are rockstars to do this alone. Hooray for progress on that bathroom! And at least you have some lights to cheer you up when you come home every day. A little bit of happiness in your day is better than a load of stress! Do you already have plans for what you want to do with the bathroom once it’s ready for paint and tile? Yay! The bathroom is getting there! Yay! We’ll be painting trim this weekend too. I can’t wait for our reno to be over too.